Note: The third in a three-part YA series, preceded by A Darker Shade of Magic and A Gathering of Shadows. 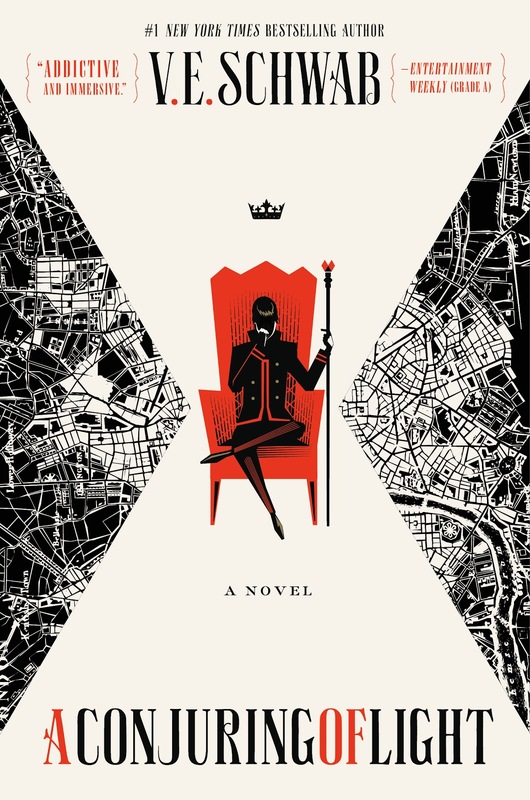 V. E. Schwab also publishes as Victoria Schwab. "Witness the fate of beloved heroes - and enemies. And an ancient enemy returns to claim a crown while a fallen hero tries to save a world in decay." "Scars are not shameful, not unless you let them be. If you do not wear them, they will wear you." Despite having read the first two installments in this series, this concluding novel was just not for me. The plotting in seemed haphazard and there was a greater emphasis on romance than characterization. I think where I differ from others who have loved the series (particularly regarding its ending whereas I preferred its beginning) was my difficulty in maintaining an investment in Lila and Kel as they increasingly become not the lead characters, but two of a larger cast. In A Conjuring of Light, Holland, Alucard, and other members of the royal family play much larger roles with the narrative focusing entirely on them for chapters or large passages at a time. I kept wanting the story to go back to Lila and Kel and not wander off into these ancillary areas. I understand the author's utilization of a larger cast--it helps complicate the story, enrich the setting, and diversify the twists and turns--but because I never felt a connection to these characters, I was increasingly disinterested and bothered by where the story spun its wheels on love scenes instead of moving forward with action, consequence, and character development. As a last note, I will add that I absolutely adore the book covers for each installment in this series. I think they are perfectly executed and are some of my favorite young adult book covers in years.